New Mars Rover is a Litterbug! Only two days on Mars and Curiosity has already made a mess! 🙂 The various components from MSL’s descent and landing process have been spotted by the HiRISE camera aboard NASA’s Mars Reconnaissance Orbiter, scattered in the vicinity of Curiosity within Gale crater. MSL’s heat shield, parachute, back shell and sky crane (with a very noticeable spray of scorched Martian soil from the thrusters!) can be made out in this image, even though it’s hard to actually discern the rover itself. It’s nice to have an eye in the sky! The four main pieces of hardware that arrived on Mars with NASA’s Curiosity rover were spotted by NASA’s Mars Reconnaissance Orbiter (MRO). 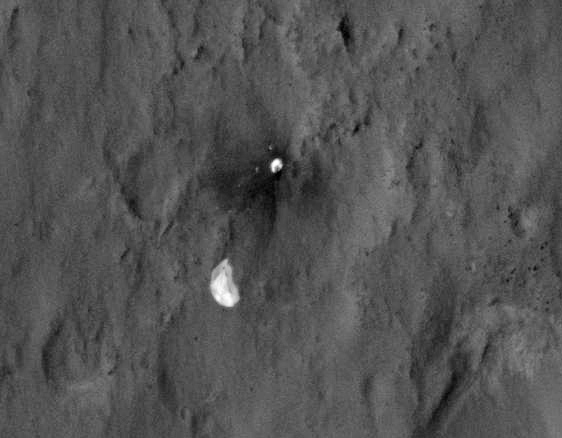 The High-Resolution Imaging Science Experiment (HiRISE) camera captured this image about 24 hours after landing. The large, reduced-scale image points out the strewn hardware: the heat shield was the first piece to hit the ground, followed by the back shell attached to the parachute, then the rover itself touched down, and finally, after cables were cut, the sky crane flew away to the northwest and crashed. Relatively dark areas in all four spots are from disturbances of the bright dust on Mars, revealing the darker material below the surface dust. Around the rover, this disturbance was from the sky crane thrusters, and forms a bilaterally symmetrical pattern. The darkened radial jets from the sky crane are downrange from the point of oblique impact, much like the oblique impacts of asteroids. In fact, they make an arrow pointing to Curiosity. The image scale is 39 centimeters (15.3 inches) per pixel. 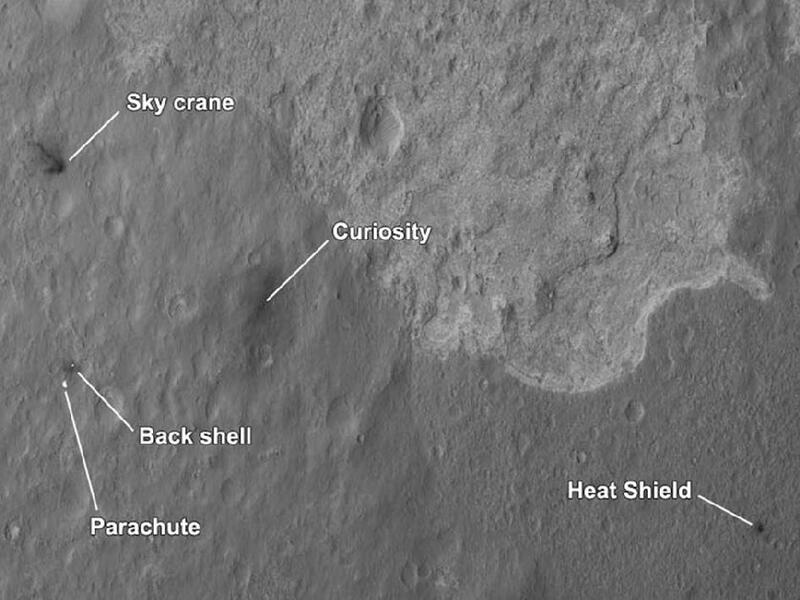 See more images from HiRISE and Curiosity on the MSL mission page here. And as seen in the litterbug photo and mentioned in the press conference, Curiosity appears to have landed near the intersection of at least 3 different surface types. It will have lots to explore! Thanks for sharing – photos and insights.